My friend Milind has just published a fascinating blog post that brings back so many memories that I wish to share them with my readers. From the comments that I have left there, you will see that to start off I was amazed that Milind wrote! I can’t think of anyone else who does that any more other than for perhaps affixing signatures for receipt of goods from couriers! I certainly don’t write anything by hand any more using my smart phone as a PDA to make notes etc. Next thing to surprise me was that Milind was using a fountain pen. I didn’t know that they are still available and in use and that too ink for them is available! A brief search online made me aware that they are still available! I don’t think that I will ever buy one but it is comforting to know that there is still a market for the pen and the ink. I am from a generation that used fountain pens extensively and I have vivid memories of shirt pockets getting stained by ink from leaking pens. I also have vivid memories of classmates borrowing ink from sensible students who had brought bottles of ink along during tests. More importantly, we hand wrote everything and were either complimented for good legible handwriting, cursive at that, or teased for bad handwriting. Coming to pens, they were items considered to be luxury during our glorious socialistic days and one with a good branded pen that did not leak from the neck was envied by mates. Theft and punishment for losing them are also part of my growing up memories. Sheaffer, Parker, Mont Blanc, Cross, Waterman and Pilot are brands that come readily to mind. For ink, we had Quink, Pelikan and Camlin inks were available at many general merchandise shops besides stationers. 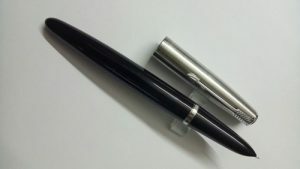 I never gifted anyone with a fountain pen as I could not afford to during the days when they were in use but, was the very proud recipient of good fountain pens on a few occasions. More importantly, being envied for such gifts was simply too good for words. On the other hand, losing one was a disaster of unimaginable intensity. I have experienced both and those memories come rushing back as I write this post. Thank you Milind for this nostalgia trip. This entry was posted in Blogging, Friendship, Nostalgia and tagged Cursive handwriting. Bookmark the permalink. 14 Responses to Fountain Pen. I only used a fountain pen for a very short period, but Jenny was using one up till a few years ago. I think she preferred the look of the writing to the writing produced by a biro. I can still remember the days at school when I used a dip pen and an inkwell. Needless to say the ink was always getting spilt, either accidentally or mischievously. After I wrote the post, I went searching for my old Parker pen and was delighted to find it safe. I shall now venture to find out where I can find some good ink for it and see if if will work. Good to see your nostalgia trip. Getting a fountain pen as a gift is one of the best things to happen, losing one is so terrible. Happy to know about your interest in fountain pens. I am of the age where small things trigger off old memories and since most of my readers are closer to my vintage, I write about those things. Your post, apart from its aesthetics, acted as one such trigger. Otherwise, I am not interested in pens at all except to use them rarely. A peculiar feature of our modern life is the inability to find a pen at home when one needs it! I largely write with pencil, HB2 Staedtler, (shopping lists, to do, notes to self, etc.) – in fact, pen/cil and paper are a must for me to feel happy. There are note pads flying around my desk for every sphere of my life. Makes interesting reading years down the line – if some turn cryptic (particularly “notes to self”). I also like the sensuality of seeing a pen/cil crawl over paper and having something to hold and touch. And I do love my handwriting – even if no one else does. Not that I don’t love typing too, but for different reasons. Mainly because it’s so FAST! However, and I may have mentioned this here before, if so forgive me for repetition: Apparently different parts of the brain kick into action depending whether you write by hand or by keyboard. I fondly remember my first fountain pen. It was a rite of passage. Where I come from at school you used pencil for the first one or two years or so before “graduating” to the oh so grown up fountain pen. Mine was a “Penguin” with ink capsules – so no spillage there. It was a lovely moment when my mother presented me with the most prized. Actually, the memory so very moving thinking how little can give so much pleasure and satisfaction. And how joyful and meaningful everything is for a child. About ten years ago I bought a Montblanc. Mainly because the guy I bought it from needed the money, but also because it was an object of desire for me. Buying ink for it (not in cartridges but little jars) was an adventure in itself. The choice of colours, Ramana, the choice … oh my god. That shop, specialising in all things fountain pen, ink and different grade paper, was an Aladin’s cave. Heaven for the paperphile. I am so glad that at least another specimen other than Milind exists! Incidentally, I was pleasantly surprised by a post card sent by Milind the other day. He had hand written a very nice thank you note and I was overcome by emotions for that very rare occurrence. I haven’t received anything hand written in a long long time. Ohhh! What memories come flooding to me now!! I loved and still love fountain pens!! The feel and the writing quality was just remarkable. My first one, I remember, was a Parker gifted to me by my grandfather, who had brought one from the US. Of course, I was forbidden from carrying it to school for fear of it getting lost or stolen. But I do admit, sneaking it out on a few occasions. In those days, the tips were very fine. And that itself contributed to a neat writing. One would preserve pens, look after them, maintain them well, and be extremely possessive and not like to lend them at all, lest the other person’s writing style damages or reorients the nib. The most popular ones, when I was in school, was a Chinese brand called “Hero”. In those days, Chinese products were not ubiquitous, nor undesirable, and especially “Hero” pens. They would come in a variety of very somber colours like black, maroon, dark green…But the signature was the golden cap! Fine, tiny nib, unlike the regular large nibs of the Camlin / Camel pens. And the naughty things we used to do occasionally like “jhatkaoing” the pen, pretending to check if the ink was flowing, but primarily to spray it on an unsuspecting girl!! And the standard ink used in our home was the Chelpark Blue-Black…I remember distinctly because somehow most others used a royal blue. I still use fountain pens, but they are largely restricted to the Calligraphy pen sets! Thanks for reviving such lovely memories!! Entirely my pleasure Geeta. You must show me some of your calligraphy one of these days. I used a fountain pen up to about 10 years ago. I had purple ink. I loved that purple ink. And writing letters with it. They seemed like heirlooms, heritage items. I don’t know why I stopped, the ubiquitous biro. Though some ballpoints have a nice slick feel to them. A flow. I’m a “heavy” writer so needed a wide nib. And of course started on those inkwells at school. Black ink. Stained even the desk not to mention clothes – I think sour milk got the stain out if memory serves. Trivia, Ha! Ink wells and what we used to call dip pens were part of my growing up years also WWW. Those too came flooding back as I was writing the post but, considering the topic, I refrained from using them in the narrative. I had many fountain pens at school in the 1960s but I think that as soon as the biro appeared, it was a goner. Even biros’ could ruin a shirt pocket in the early days.. I did not do justice to his post on the aesthetic side of the post. The way he caught the sunlight in it and blogged about it is wonderful indeed! Big John recently posted..More hypocritical Harry ! I can imagine a great deal indeed!